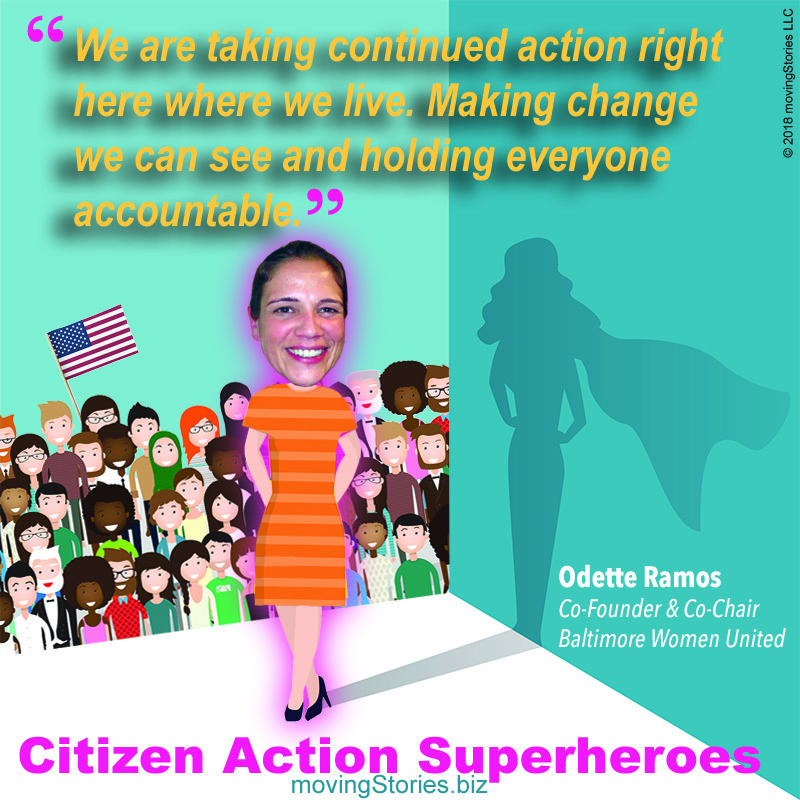 Independent activism: Co-Founder and Co-Chair, Baltimore Women United (Maryland). 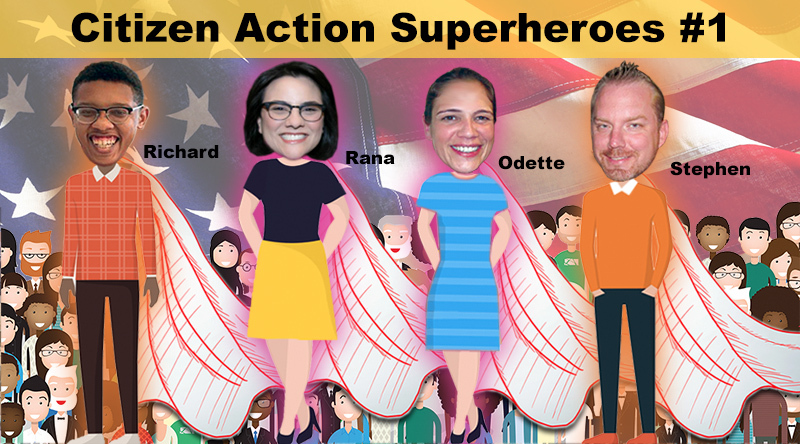 A group of volunteers activating women as voters, constituents, candidates and donors, with an emphasis on intersectional feminism. Join our activism force: 1,500-member email list and 4,000-member Facebook group, across both public and private channels. Q. What scares you the most about these times? The way that Trump is handling things, we could easily be at war anytime soon. That’s super scary. And the fact that all of his people are really coming after women, people of color, immigrants, Muslims, LGBTQ and others. People are being targeted for who they are. What’s next? People being targeted for their activism? Their political views? Because they disagree with their government? This is already happening. So, our work is more important than ever, not only to resist but also push for progress. Also, women’s reproductive rights are being threatened. Maryland is a pro-choice state. So, whatever happens with Roe v. Wade, we will always allow for safe and legal abortions here. But what about women elsewhere? It’s important to me that all women have the right to choose. Q. How does your activism feel good? It’s an amazing feeling when you’re there, side-by-side, with other women who I see as my sisters. Just the feeling that we’re all in this together. We all feel and experience challenges, and we’ve all got to fight really hard to make change. The other challenge is making sure we do all this with an intersectional lens. So that if there is equal pay for white women to white men, but then Latinas and African-American women are still not getting that equal pay, then the fight is not over. Unless all of us have reached the goal, it is not accomplished. This is what it means to be an intersectional feminist. The work and the results energize me to keep going, as a woman and as a Latina. Q. 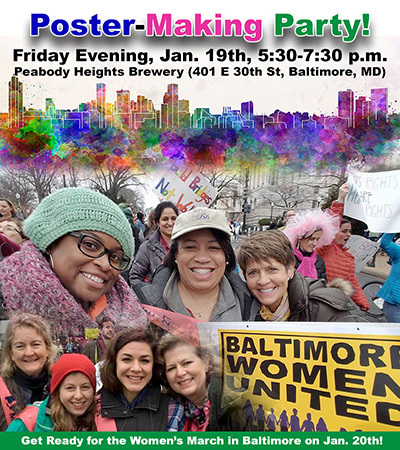 What is the value of Baltimore Women United? It’s important to have a place like Baltimore Women United. It’s helpful, frankly, for me to deal with all this craziness. Okay, we marched, now here’s the next action we can take. It’s about going deeper. We can take our bite out right here where we live. Making change we can see, holding everyone accountable. There are women involved in Baltimore Women United who have never been active at this level before. Some said that speaking with people, going door knocking and other actions were not in their comfort zone. But you know what? They’ve done it anyway. Because this kind of work is super important, and it helps. In addition to action right now, we are building women leadership and confidence for the struggles ahead. Q. What are some of your superpowers to share with others? When we do this work, we try to do everything in partnership with other groups. Doing so helps get the word out to a lot more people. And we all are, truly, stronger when we link arms. Also, I try not to be judgmental and meet people where they are in terms of getting active. Everybody’s got their lives, families and work. So, they’ll get active when they’re ready. Not everybody has to be doing the same thing. Just do your part. And it’s happening. It’s all working. Q. What gives you signs of hope for the future? My Mom went to her first Women’s March in Puerto Rico where she lives part of the year. I was shocked. And very proud of her! 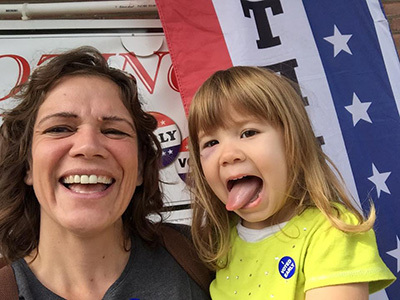 And I see our six-year-old daughter who watches her Mom and Grandmother fighting on behalf of women and for the rights of everyone. We try to take her to lots of different kinds of meetings and events, but I also don’t want to put such a burden on her so early. Let her be a kid. Yes, we’ll talk about the fact that she has brown and black kids in her class and all of that. And sometimes I’ll get upset about Trump and say something. When she’s ready and the time is right, then we’ll get her more involved. But she is absorbing everything, even though I am letting her be a little girl first. I am also excited that more women are running for office. We need a seat at the table, and more importantly, we need to re-set the table. By having women inside the system and pushing from outside the system, we can make real change. Q. What is the best way forward? I think a lot of people are handling the destructive chaos coming from the White House and our society in different ways. Some are just wilting like a flower and saying, “Oh my gosh I can’t do this anymore.” Other people are getting active. And still others are doing something in between. Not only do we need to get more active, but people have to speak out individually when something harmful or unjust happens. And finally, I’m hoping that we, as a nation, have learned our lesson. And that even after Trump is gone, women keep going, sustaining and growing what we have started. Let the legacy be momentum for a continually better future. 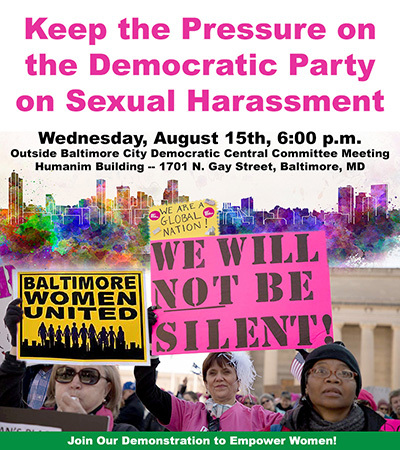 We women here in Baltimore are united on that front.